After New Installing Antergos, I maybe see a little difference with fonts on Antergos. I used bohoomil (fonts) before. But now I cant do that. So can you tell me about the way to render fonts for my case. @markupstart I tried it and success now. Thank guys!!! I can confirm the workaround does work, as I just got it installed this way. Hopefully this will be fixed soon without the workaround. Best for Laptop, Gnome 3 for sure, controling for anything just by Super Button without mice. Love it! You mean i just edit mount point not create a new dev? 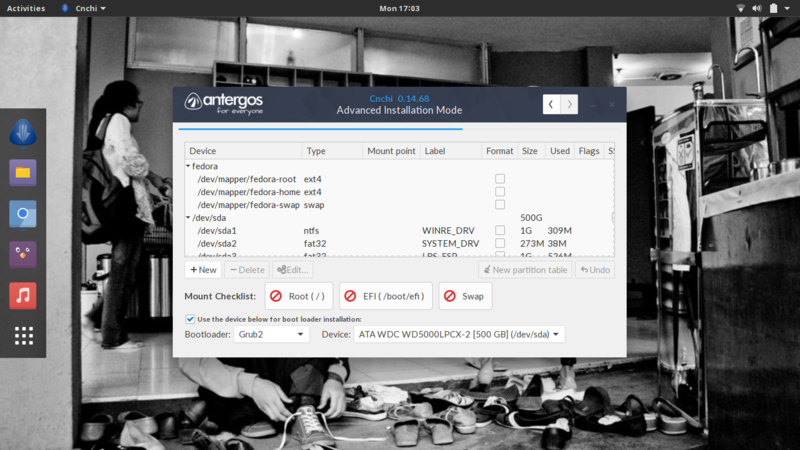 I think it was update to Gnome 3.18 or 3.20 so that it will be different with Gnome 3.16 of Antergos theme. it changed topbar, dock and colors. I tried with Tweak Tools but cant return the Antergos Theme so that i decide to reinstall Antergos. I installed Antergos for many time before, but i always wonder that i have a mistake? Plz give me a directions, should i do next steps?